BEIJING, Oct. 22 (Xinhua) -- The 17th National Congress of the All-China Federation of Trade Unions (ACFTU) opened in Beijing Monday. President Xi Jinping, also general secretary of the Communist Party of China (CPC) Central Committee and chairman of the Central Military Commission, attended the opening session. The meeting was also attended by other leaders of the CPC and the state including Li Keqiang, Li Zhanshu, Wang Yang, Zhao Leji and Han Zheng, all members of the Standing Committee of the Political Bureau of the CPC Central Committee. 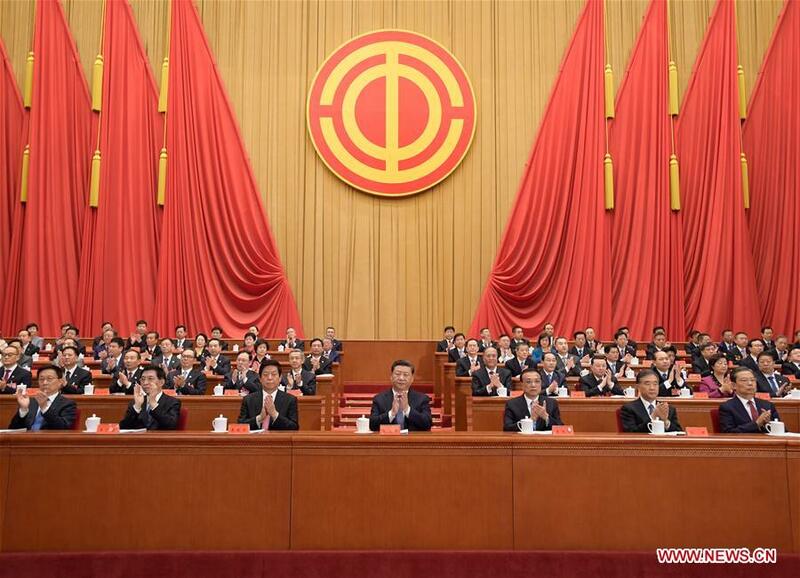 Wang Huning, also a member of the Standing Committee of the Political Bureau of the CPC Central Committee, delivered a speech on behalf of the CPC Central Committee. Over the past five years, trade unions at all levels have mobilized employees to make accomplishments at work, promoted harmonious labor relations, and pushed for reforms and innovations of trade unions, among other achievements, Wang noted. He said Xi's important discourses on the working class and the work of trade unions have pointed out the directions of innovations and development for labor movement and trade unions' work in the new era. "It is the common task of the whole Party and Chinese people of all ethnic groups, as well as the historic mission of the working class, to realize the great blueprint laid out at the 19th CPC National Congress," Wang said. He urged the working class to implement the spirit of the 19th CPC National Congress, hold fast to their ideals and faith, give full play to their enthusiasm, advance reforms and innovations, and improve their working skills. More than 2,000 delegates from all walks of life, along with nearly 100 specially invited delegates, attended the national congress. The congress is held every five years. The previous session was convened in Beijing in October 2013.